There are so many useful tools online that companies and businesses can use these days to improve their inbound marketing campaigns. In fact, many of these have become so commonplace a business could very well be lost if they do not take advantage of it. While in the early days of the World Wide Web, just having a website for online presence was enough, those days have long gone. Now it is more important than ever to have visibility on various social media networking channels and blogs. Of course, maintaining a blog takes time. Keeping your content marketing fresh is crucial to the process. It is, in fact, critically important to keep your blog posts up to date if you are going to bother to have one at all. Part of the most important aspect of this is not only attracting an audience, readers and followers, but letting them know you are still around and in business, as well as current with your industry. According to HubSpot, “companies that blog at least 20 times per month generate 5X more traffic than those that only blog a few times per month.” The truth is there is not a set answer for this. What is important is that you do so on a regular basis. Content marketing and using sites such as WordPress to create a blog are ideal ways to use attraction marketing for your inbound marketing campaign. Some of this really has to do with the number of visitors you are getting to your blog. The less traffic you have, the less often you need to post. Of course, to begin to use SEO and get higher rankings and more traffic, making sure you do not lag behind in your posts is crucial. 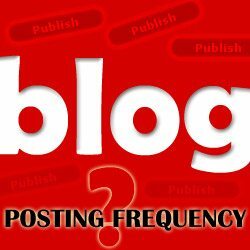 Also as traffic begins to increase, so should the frequency with which you add new blogs posts. Stale content and a good deal of lag time between posts can turn off your usual customers or cause you to lose potential ones. When in doubt, check out your competition. It is guaranteed that the bigger the outfit the steadier and more regular the content marketing efforts through updated blog posts. Some companies fall behind in their blog posts because they feel they lack fresh content. Even those experts in the field can sometimes run dry when it comes to ideas in the content well. It could even be the field you specialize in does not have groundbreaking news that often. This is no excuse to fall behind in your content marketing. Waiting for the news to break could take a while, so why not cause it to break? If you have followers who look to your blog for current data as though you are an expert in the industry, you had better come through and deliver on this or lose your market. There is always a new spin you can take or content you can add, as well as ways to find it. One of the best devices for content searching bloggers use these days is Google Fresh. You can search for the most current content on your field of expertise by using Google Fresh as your search tool. Also using Google Alerts will help you be notified when certain keywords come up, which can also lead to more ground breaking and current news on your industry. Staying current with what your competition is doing with their blogs is also important. If you want to know what they post and how often, get signed up for their RSS feeds. Take the time to read their blog posts too, not just how often they post. Also, see how often they mix it up by using other forms of media such as video clips to convey their message and content. You may not be able to outdo your competitors, but you should at least be familiar with the blog posting frequency and quality of their content marketing campaign. People also wonder if quantity is more important than quality when it comes to blog posts. As with almost anything else, quality is still king. If you have to post less often, but deliver interesting and engaging content as a result, followers will forgive this. Make your content worth readers sharing with others and that is more priceless than producing a greater number of posts that no one really wants to read or review. → Blog Posts: Does Anyone Really Comment Anymore?